Error: 691: The remote connection was denied because the user name and password combination you provided is not recognized, or the selected authentication protocol you selected is not permitted on the remote access server. I know that my username and password is correct so I figured it must be something else. Turns out, it’s an easy fix. 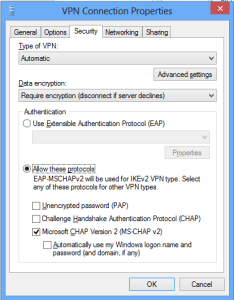 Open your VPN connections properties. I’m guess this is a bug of some sort. Once you select one of the two radio buttons, you can’t deselect them which leads me to believe that it is a bug. Hopefully this will be fixed in an upcoming Windows update. Great help, thank you profusely. Thank you. You are a world of help. Thanks man, saved my day! Thank you very much. I was getting crazy with this VPN. Yes ,, I was also in trouble for this issue but ur help work for me amazingly !!! Thanks a ton man !!! Fixed my connection problem. Thanks. I know this post was almost a year ago, but thanks for the easy solution. 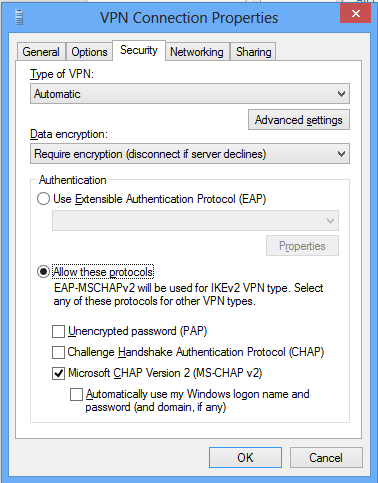 I have been trying to figure out why my VPN client all of a sudden stop connecting. Thanks! i cannot connect with ActiVPN !! Thanks so much! Thanks so much! Thanks so much! This was precisely the problem, many thanks. Weird though that these things do not work right away. If you are a standard user you don’t want to configure these things. You just want it to work.